More video images of the last hours of Princess Diana and her boyfriend Dodi Fayed, including scenes of paparazzi swarming outside their hotel, were set to be shown Thursday to jurors at a coroner's inquest. The jury, which must decide whether the couple's car crash death on Aug. 31, 1997 was an accident or murder, has already seen images of their arrival at the Ritz hotel and comings and goings through the evening, taken from 31 security cameras at the hotel. The behavior of the photographers is a key element in the investigation. Diana and Fayed canceled plans to dine at Chez Benoit in central Paris because of the number of photographers following them, and returned to their hotel. Shortly after midnight, they left the hotel from the back entrance in hope of eluding the cameras, and were fatally injured in the car crash minutes later. Whether Diana and Fayed had planned to announce their engagement on Aug. 31 is one of the questions before the jury, as is the claim that she was pregnant with Fayed's child. Both claims are part of Mohamed al Fayed's insistence that the princess and his son were the targets of an Establishment plot directed by Prince Philip, the queen's husband. The coroner, Lord Justice Scott Baker, told the jury on Tuesday that there was evidence that Diana was using contraceptive pills, and that she had given no hint to friends and associates that she might be pregnant. Baker has noted, more than once, that the romance was just six weeks old when the couple died. Jurors saw video of the couple arriving at the Ritz Hotel on Aug. 30, 1997; Fayed leaving for a short car ride across the Place Vendome to Repossi jewelers, returning shortly with a brochure; Ritz executive Claude Roulet returning with what was described as a bag of rings from Repossi's "dis moi oui" (tell me yes) line. A video image of Diana smiling as she stood in a Ritz elevator with Fayed at 4:35 that afternoon stirred some excitement in Thursday's newspapers. "Her last smile," The Sun's headline said. 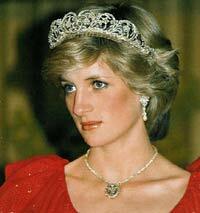 "Haunting images of a joyful Diana hours from tragedy," The Daily Telegraph said. The Daily Mirror said few photographs of the princess "ever captured her looking quite as relaxed and happy." "What did her smile signify?" the Daily Mail's front page asked. "She radiates happiness," the Mail said, contrasting it to a photo of the couple's final, fatal departure from the hotel - showing the back of her head - "in which she appears anxious and agitated."